Many people wrongly believe that installing a solar power system at home is an expensive affair. In fact, setting up a medium capacity solar power generator will not cost as much as you fear. Advancement in technology and improvements in material have brought down the cost of installing solar systems at home considerably. 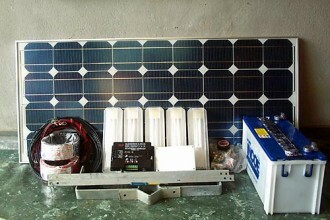 If you can spare around $1500, you can easily set a small solar power generator up at your home. It may not meet all your home power needs but will be quite sufficient to work most of your home appliances like TV and computer which need less electricity to function. You can also recharge the batteries of your cell phone and laptop. 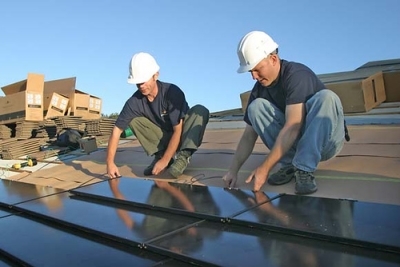 Cost of installing a solar system increases when you employ professionals to do the work for you. It is not a very complicated and highly technical work and you can do it yourself so that you don’t have to pay the labor charges. Everything you need to install solar panels at your home can be bought from the local stores. Or there are online stores where you can buy the supplies from. You also need a convenient place like your roof or window to set up the solar panels. Choose a place that gets the maximum sunlight. Once the different components are connected by wires, you are all set and ready to go. Let us start with the most important component of the solar system. It is the solar panel and you can buy an average sized solar panel for about $200. The panel you buy must be capable of producing at least 12 volts of electricity but a 16 volt panel will be ideal for your home. Foldable solar panels supplied by PowerFilm are more convenient than others. The next costly item you have to buy is a rechargeable battery. It must be a deep cycle battery like the one you use in your car. A 12 volt battery can be bought from local auto parts store at a cost of $60. Of course, gel batteries will cost very high but they last longer. A battery box, which can be bought for about $30, will not only keep your children and pets away from the battery but will also help you to fix some other components of the solar system onto it. You will also need a DC volt meter to check whether the battery is being charged or not. This item will cost $30 and can be bought locally. The next item to be bought is the DC inlet which will help you to plug in your DC home appliances. Since you will have a number of appliances which work on DC, let there be three or four sockets on the inlet. It will cost approximately $20. To convert DC into AC to work some of your appliances, you need to buy an inverter. The capacity of the inverter depends on the number of appliances you are going to use and their power demands. A 300 watt inverter will just suffice. The inverter will cost another $40. Once all the necessary parts are bought and made ready, the only remaining work is to join them with wires. Positive and negative terminals of the solar panel are connected respectively to the battery. Then connect the volt meter and the DC inlet to the battery. Power supply to the inverter can be taken either directly from the battery or from one of the DC inlet sockets. The battery box will serve as a convenient place to install your DC inlet, inverter and volt meter. Now your solar system is ready to produce solar energy and you can be proud of it.